First, need to press the bottom, and then please pull and down while is pressed, you could adjust the desire the length you need, finally, release the bottom at the same time, easy to adjust proprietary slide mechanism. More details please reffer to our use manual. 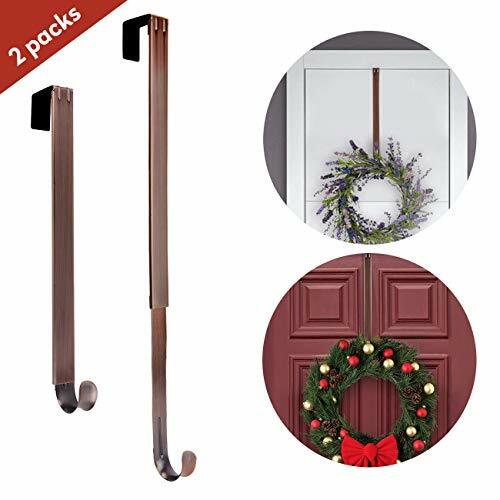 ② Christmas decorations in your own style with this easy to ADJUSTABLE metal door hooks making it the perfect height, extends from 15.15" to 25.19",decor your door and increase your home festive atmosphere. ③ Door Wreath hanger anti- scratch, anti-oxidation, smooth surface, allows for easy placement and removal. it is perfect to use in bathrooms, bedroom, give you more convenient to hanger your clothes, coat, handbags, umbrella etc. If you have any questions about this product by AnCintre, contact us by completing and submitting the form below. If you are looking for a specif part number, please include it with your message.